I have a 2 acre hillside no-till orchard that I seed with a cool weather legume mix each fall, then flail mow in the late spring for a mulch. I used to seed by cutting shallow furrows with a spring tooth harrow, then hand-crank broadcasting and dragging to cover the seed. It sort of worked but lots of seed remained on the surface and was wasted. So four years ago I finally built my own seed drill onto a modified disc harrow. The heart of the machine is the seed metering system which uses neoprene blade outboard motor water pump impellers running inside a 2 1/2" PVC pipe to carry seed from each input hole down to an output hole in even amounts and with no seed damage (I used a rigid rotor on an earlier prototype and found it broke too much seed). This new system works great. Click on each picture to see a title and description. I had to use only one gang of the two gang offset disc to lighten the implement enough to use on my compact Kubota BX1500. The single gang disc is not ideal because it pulls to one side, so on side slopes I need to only seed one direction or it wants to run off track downhill. A two gang offset disc could be used, modified so front and rear discs are essentially in one track and offset very little to make a narrow groove in the soil. Or ideally a box frame type disc, with a single gang split into a V shape, would cancel any side pull. My setup works well for now, but I'm on the lookout for a small box frame disc for version 2.0. 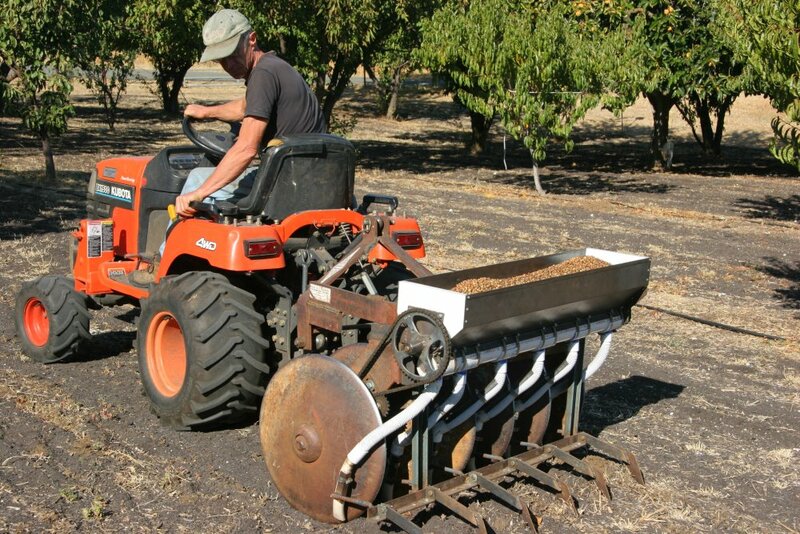 For soft tilled ground, depth control wheels could be added to limit cutting depth. But for my dry California fall soil my design cuts about right on its own. After seeding I follow with a ring roller (cultipacker) to pack the soil. The seed metering system works so well I just wanted to share it in case anyone else wants to adapt it to their needs. It could be run by electric motor instead of ground-driven and mounted on other implements such as a spring tooth harrow. I will be showing this implement in the equipment showcase at the upcoming Davis Farm hack event on Nov. 16, 2013.